Weather sidebar gadget is one of the built-in gadgets in Windows Vista that users can add to Windows Vista Desktop Sidebar to display weather condition and temperature in degrees Fahrenheit or Celsius. 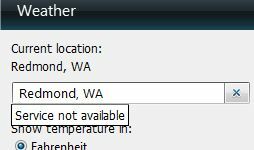 In some cases, after adding Weather gadget to Sidebar, the gadget appears down and not working, and display may be showing the following error message: Service not available. When hover the mouse over the gadget, the tooltip will show Service not available in your language or region. If user opens up configuration page and attempts to search for a location, even if the location is in US or North America, the search will return message “Service not available” too. The issue may occurred because of that your current location does not support the Web service that is used to retrieve weather data, or most likely, a bug in Vista or Weather Sidebar Gadget that cause Weather gadget do not work properly when the location, format and system locale is not set as standard settings, i.e. English (United States), although it’s not a requirement for system regional settings to be in English to run Weather gadget. To solve the problem and make the Weather gadget working, Microsoft suggests the resolution to ensure that settings on the Formats tab matches the settings on the Location tab, by selecting the region of format in Formats tab that is corresponding to the current location in Location tab in Regional and Language Options dialog box. For example, English (United States) format should match with United States as location and so on. If the service unavailable problem still unresolved after step above, try to change system locale for Windows Vista to English (United States) too. Sometimes, simply by changing system language locale alone is enough to solve the Weather gadget issue. To change system locale, go to Control Panel -> Clock, Language and Region, and click on Regional and Language Options. Click on Administrative tab, then click on Change system locale button. Select English (United States) as the current language for non-Unicode programs. If you can’t set to English, try to select the same for regional language display format and system locale. Note that changing system locale shouldn’t affect how Windows Vista works, as the setting only applies on non-Unicode programs that may be using character sets non-native to or not supported by installed Windows Vista system. Once made the changes, refresh the Weather gadget by closing and re-adding the gadget to the sidebar. For users who need to use non-English as system language or locale, there is a hack to make weather gadget works everywhere. If nothing helps to make default Weather gadget working, try to download and install alternative weather and temperature gadget from Windows Live Gallery Vista Gadget section (gadgets has been discountinued) such as WeatherBug (gadgets has been discountinued) and AccuWeather.com Forecast Gadget (gadgets has been discountinued).